It's no secret that we are a Lego mad house. All of us, the girls too, so when John Lewis asked if we'd like to review the awesome Lego Storage Head we jumped at it. This is a great product, perfect for Christmas and if it means that I stand on one less Lego brick in my life then it has to be worth it! The Sort and Store Head is available in store and online, priced at £39.95 (not £16,95 as stated in the vid, sorry we got confused but you can pick up the regular Storage Head at that price). Now I'd like a stack of the standard Lego Brick shaped boxes please Santa! 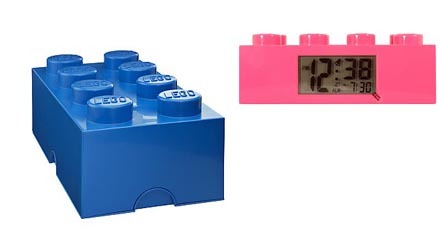 The 8 Stud Storage Brick is £22.95 and this really cool Lego Brick Alarm Clock is a bargain at £19.95. PS. It's my birthday next week! I love these and would love to get one for my son but the price puts me off - don't you think £40 is overpriced for a bit of plastic storage kit? Would you have bought one if you hadn't got it for free? We have a couple of the big storage boxes and one small one. Love them! I've just ordered another one - so I guess my answer is yes I would buy it! Oh my I love the LEGO head, how clever is the tiered system, I can not wait for my kids to be old enough for Lego so that I can I mean they can play with it.